Have you ever wondered how to make tuna salad that's healthy? If so, you will be glad to know that my tuna salad recipe is so simple and quick to make…and incredibly healthy too! Tuna is a rich source of omega 3 fatty acids which are essential for proper brain function and keeping the heart healthy. It is advisable not to eat tuna more than three times a month because of the possible mercury contamination which tuna get from eating smaller fish which have mercury contamination. Tuna also makes our list of heart healthy foods. I love canned tuna recipes because they are so convenient – I keep my cupboards stocked with tins of tuna so that I always have some on hand when I need to whip up a quick and nutritious meal. I use naturally yoghurt mixed with mayonnaise because it is healthier than using mayonnaise only – and if you use a good quality mayo, you won’t loose anything in the taste department either…it is really delicious, trust me. This tuna salad is such a pleasure to make and is a lovely simple answer to the question “how to make tuna salad”. 1. Open the tins into a bowl. Add the yoghurt and mayonnaise and mix together. 2. Add the celery, spring onions and pepper. 3. Gently mix together and serve. A chopped tomato or a few cherry tomatoes will be utterly delicious addition. Try adding some chopped avocado. Avocados are incredibly good for the heart. 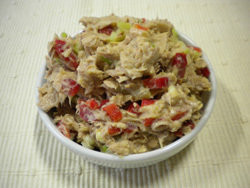 This wonderful tuna salad is great served on whole-wheat or rye bread. It makes a very tasty and healthy sandwich filling for work or school. I love to serve it with a green salad for a light dinner. It's one of many healthy tuna recipes! More free healthy recipes here!